On 25th of February Sanjay Dutt finally walked out a free man from Pune's Yerwada Central Jail! Here is a minute by minute of Sanjay Dutt's day post release. 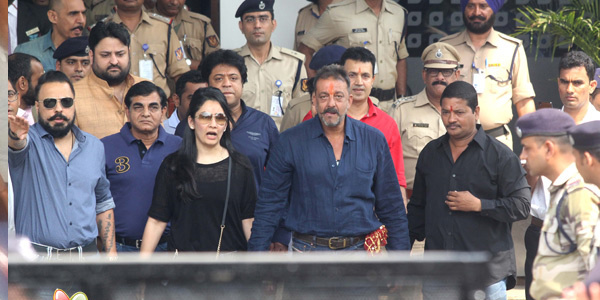 7:00 am: The gates of Yerwada Central Jail are opened and Sanjay Dutt is seen walking out wearing a dark blue shirt and jeans. 7:15 am: The actor on his release turned near the gate to face the prison and bowed down touching the mother land expressing his gratitude to the Indian soil as a proud citizen he further gave a salute of pride to the Indian Tricolour fluttering atop the prison wall. 7:20 am: Sanjay Dutt greets his family and friends outisde the jail. Present to receive him outside the YCJ were his wife Manyata and filmmaker Rajkumar Hirani, writer Abhijat Joshi, his lawyers, thousands of fans and a huge media contingent from across India and abroad. Close friend and film maker Rajkumar Hirani documented the Sanju's release.The actor's exit will be the first shot of the Sanjay Dutt biopic which Rajkumar Hirani is directing. There, he addressed the media and credited his fans for their unending support. He said, "I am here because of their (fans') support. And there is no easy road to freedom, my friends." Sanjay Dutt along with family and friends proceeds to Pune Airport at Lohegaon to board a chartered plane to Mumbai. 11:00 am: Sanjay Dutt arrives at the Kalina Airport. 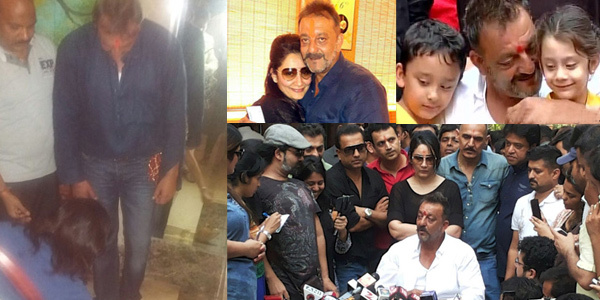 12:00 pm: Sanjay Dutt visits Siddhivinayak Temple in Prabhadevi to seek blessings. 12:45 pm: Sanjay Dutt reaches Bada Kabrastan near Marine Lines to pray at his mother's grave, the Late actress Nargis Dutt. The actor visited the grave alone while Manyata Dutt waited outside as women are not permitted to enter the premises. 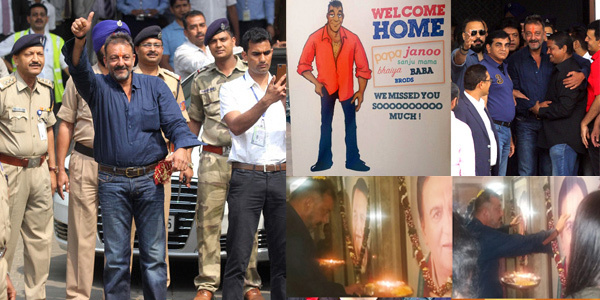 1:00 pm: The Dutt household gears up to welcome their beloved Sanju Baba home. A Life size animated poster consisting of the many names he is addressed with by family members stands tall at the gates of his residence at Pali hill, Bandra. 1:15 pm: Sanjay Dutt departures from Marine Lines for his house. 2:00 pm: The Dutt family consisting of sisters Priya and Namrata Dutt along with their family, relatives of the actor and close friends assembled near his building gate with a Puja ki Thali, eagerly awaiting his homecoming. 2:15 pm: Sanjay Dutt arrives at Imperial Heights. He is welcomed by sister Priya Dutt in a tradition manner. Sanjay Dutt then goes on to give a 'Jadoo ki Jhappi' to his beloved sister. 2:20 pm: Sanjay Dutt reaches his house. On entering the door, he walks to the portrait of his father, the Late Sunil Dutt to perform a puja and seek blessings. 2:45 pm: Sanjay Dutt comes downstairs to greet the huge media contingent and horde of fans outside his residence. In merely a few hours since his release, Sanjay Dutt has already bagged his first film in his second innings. The film is a big- scale action film, directed by Siddharth Anand that will be shot across six countries. The film is expected to take off this summer and is likely to release this year itself.